We believe that Bengals should be recognizable as a Bengal even in dim lighting when the pattern is not visible. Because some of our selection priorities are different than TICA’s Bengal Standard, we present them here. 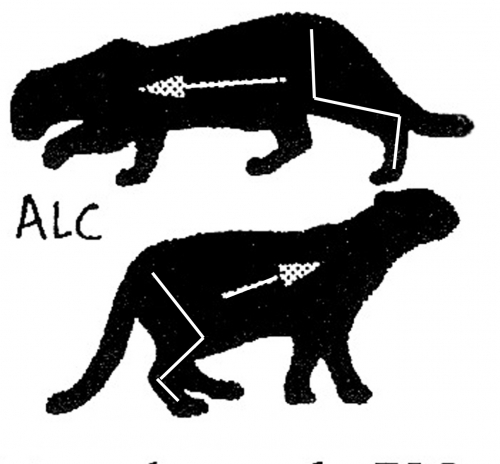 These silhouettes of an ALC illustrate the wild structure we select. BODY STRUCTURE: The body is longer than tall and higher in the rear than the front, with a rectangle of space below the belly rather than a square: A long muscular neck flows into the head which has a diameter similar to the neck. The spine in profile appears as a continuously curving top line, with slight indentation behind the shoulders. The hindquarters are rounded off with a 45 degree sloped rump. The tail is always carried low. It is substantial; large enough to balance the cat as it lands from a leap. The tail is thick, non–tapered and when folded to the side forward along the body, it just reaches the shoulders. HEAD STRUCTURE: The head and face are very important to the overall wild look of the Bengal Cat. The top of the skull is smoothly curved, not flat, with NO break (abrupt change in direction, making a slight angle) above the eyes at the eyebrow. From the profile view, 1/3 of the head is back skull behind the ears, and 2/3 of the skull makes up the face. The forehead from the ears to the eyes is twice as long as from the center of eye to bottom of chin. The front part of the chin is curved in profile to match the flowing profile of the rest of the head, not squared off like the box–like muzzles of some of the Big Wild Cats. WHISKER PADS: The muzzle is no wider than middle line of the eyes. The whisker pads are puffed and full. NOSE: wide with an even width from top to bottom, nose leather puffed up, curving outward from left to right and top to bottom, Nose leather is buried in between the whisker pads, not sitting on top of them. EYES: Large rounded eyes, not oval or almond. The eyes look like round eyeballs behind their lids and can be seen to protrude forward from the eyelids from the profile view. They are set well below the nose bridge in the profile view. Prominent rounded cheekbones frame the face below and outside the eye socket; while below is well cut in, adding to the definition. FACE MASCARA: Equally important to the shape of the face is its pattern; We select for strong black and white facial markings including vertical forehead lines (no Tabby “M”) with a strong chin strap and distinctive black and white / light mascara around the eyes. The other feature defining breed type is coat pattern. Very important, perhaps most important, is the overall FLOW of the pattern in a diagonal or horizontal direction….The pattern looks like it has motion when you are 5 to 10 feet away from the cat. We do not care as much about the shape of the individual rosettes as we do about the “Pattern Flow.” We focus on eliminating all vertical alignment on the body and all tabby striping on the legs and chest. The picture of the ideal Bengal would not be complete without a white or virtually white underbody. In order not to fade, the black markings must be based upon black self-ed hairs in all of the black pattern outline areas, black from tip to base. We seek a very light background color on the body and a third color inside the rosettes, preferably a rust based color. Texture is like no other cat and each Bengal has a unique feel to the coat….. a spectrum from softness similar to fabrics from raw silk to acetate. Half The Sky at 8 weeks, About Face at 8 weeks, Hamachi at 10wk, and F4 RainForest Ruby Two Shoes from the mists of time; the source of all these wild looking SBT kittens.